Blankets Creek has become one of the most renowned and well-ridden trails in the entire country. There are a total of 7 different trails that range in difficulty from beginner to expert, making it a great place for families and expert riders alike. The trails are wooded, and situated next to Lake Allatoona, with a few creeks that run through the area as well. If you've never been here, you need to check it out; you won't be disappointed! 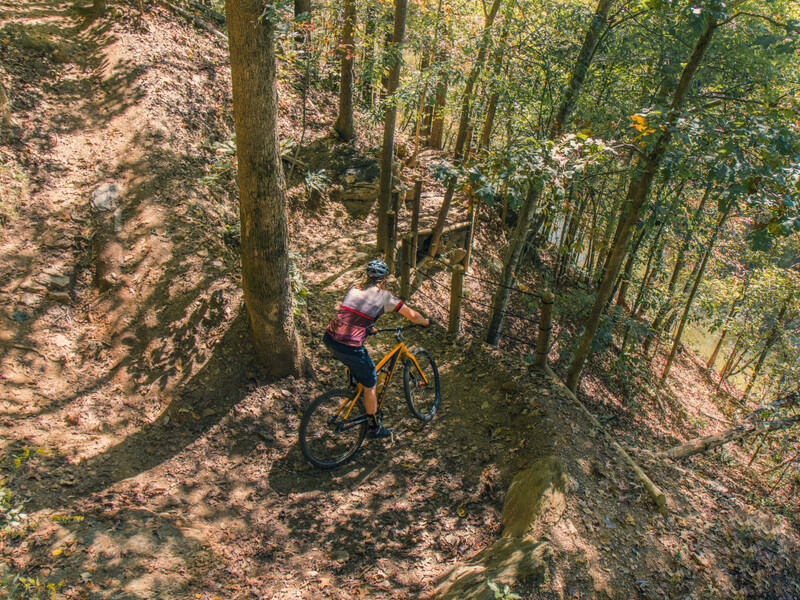 The Blankets Creek Mountain Bike Trail System is known for being one of the best mountain biking destinations in the state. It is famous for its expertly maintained trails, including the amazing "Quehl Holler": a one-way downhill jump and obstacle run for experts only. The Holler is complete with a giant wooden berm, double gap jumps and several other obstacles; it's an expert rider's paradise! For the less experienced rider, there are 6 other trails, ranging from beginner to advanced: Mosquito Flats (1 mile), Mosquito Flats Extension (.5 mile), Mosquito Bite (.7 mile), Dwelling Loop (4.2 miles), South Loop (4.2 miles) and Van Michael Trail (3.9 miles). The trails become increasingly more technical, respectively. Mosquito Flats, Mosquito Flats Extension and Mosquito Bite are all beginner trails, great for novices. These trails are much flatter than the others (specifically Mosquito Flats), making them very kid friendly and easy to navigate. Mosquito Bite is the trickiest of the 3, so it is normally recommended for older children only. The Dwelling Loop is the only intermediate trail, and by far the most popular and highly trafficked out of the 7. This trail boasts views of Lake Allatoona and the surrounding creeks the entire way, making it very picturesque. You may be tempted to take a break on one of the benches, or even trek down to the water for a bit while you’re on this run. It’s hard to resist when it’s within view the entire time. This is one of the longest trails in this system. The South Loop and the Van Michael Trail are the advanced routes, and are quite technical. These are only recommended for more experienced riders! The South Loop is hand-cut, and receives very minimal maintenance to give you the feeling of riding in a wild, rocky, mountainous area. It is the same length as the Dwelling Loop, making it one of the longest trails in the area. Quehl Holler is for experts only. It is a short, fast-moving, flowing one-way downhill jump run, consisting of double gap jumps, berms, steep drops, a tabletop and the famous “Wall Ride” at the end. Full face helmets and safety gear are recommended for this run. Ride with caution. 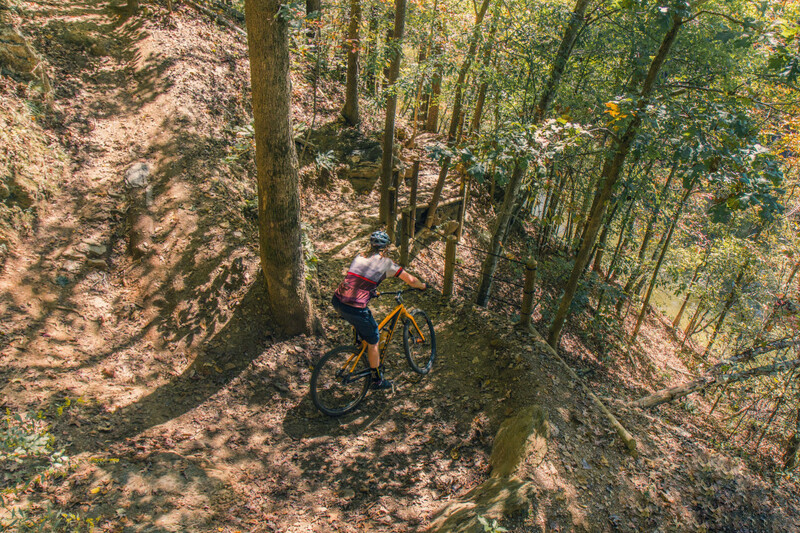 Some things you can expect to experience on some of these trails: tight turns, switchbacks, elevated bridges, hills, rough tread (rocks and roots), elevation changes, tree gates, log crossings, tabletops, jumps, berm turns, and the famous "Wall Ride" (large wooden berm in Quehl Holler). All of the trails are well marked; signs at the starting points display difficulty levels and other relevant information. All trails are day directional, so be sure to check the signage before you begin your ride. Any runners should always go the opposite direction posted on the sign, and be mindful that cyclists always have the right way. Runners should also note that dogs are allowed on most trails, but there are a few where they are not allowed. Local experts will almost always claim the South Loop as their favorite. The machine-cut Van Michael requires a lot of endurance, as it is very narrow and steep (but smooth), with almost constant elevation change and tricky drop-offs. Watch out for the infamous “Kevorkian Pass” on this one. This trail is not for the faint of heart. All levels of riders ready for a great day out. The gravel parking lot is huge, and easily spotted from the road. The lot has very clean full-service bathrooms, water fountains, large pavilions with picnic tables, and a few open fields, which are great for relaxing post-ride. It’s a great spot to have a picnic as you cool down. This place is a suburban mountain biker’s haven. 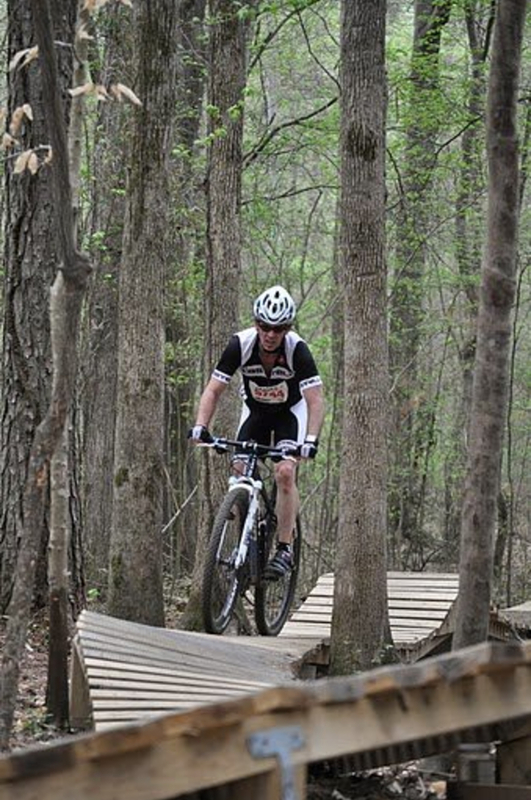 As you ride along on any of these trails, you’ll notice a number of trails marked “Emergency Access”; these trails will take you back to your car quicker in case of injury, inclement weather or some other unforeseen circumstance. The emergency access trails on the outskirts of the trails will also lead to the water below, and during your ride, it is not uncommon see a fellow biker relaxing in an Eno hammock at the edge of the trees. This area is very peaceful and quiet, giving you the illusion of being much farther out of town than you really are.